1. Blend all ingredients together using a food processor or handheld blender until you get a very soft and ‘dough-ish’ batter. If your batter is too wet or sticky, add a bit more of the coconut flour (or some more brown rice flour). 2. Shape four ‘rolls’ (see the picture to the left here) and bake them on a nonstick tray (ideally silicone) at 160 C (320 F) for around 20 minutes or until, when poked with a knife, your knife comes out clean. 3. Let the rolls cool before slicing. 4. Enjoy with your filling of choice. Here I used Muscle Food’s Pacific salmon which I steamed for 15 minutes with some lemon and sea salt earlier today. It’s phenomenal! If you’re in the UK, I strongly recommend you try it. 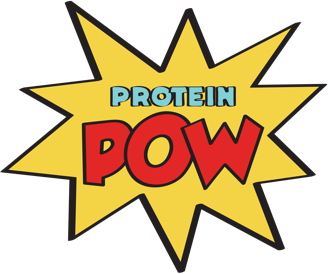 You can use our exclusive Protein Pow code to get 5% off too. The code is POW5OFF. Enjoy it! In both sandwiches, soups, fish cakes, and of course solo – by roasting, steaming, or pan-frying it. Either way you cook it, it’s categorically sublime. Macros per bread roll, out of four (without the filling as that’s completely up to you): 172kcals, 8g protein, 24g carbs (out of which 5g is fiber! ), and 4g fat.